In Hearthstone‘s first official expansion – Goblins vs. Gnomes – we’re thrown right in the middle of the endless battle between the two races of troublemaking tinkerers…and now have their mechanical creations to deal with! In their neverending quest to outwit, outlast, and out-invent their rivals, the Goblins and Gnomes of Azeroth have made a mark on the landscape of the game by bringing along a whole slew of minions to fight for them – the all-new minions called Mechs. These formidable constructions serve to fight and defend (with questionable reliability) so keep an eye out for clockwork robots with the same disregard for safety that their makers have. 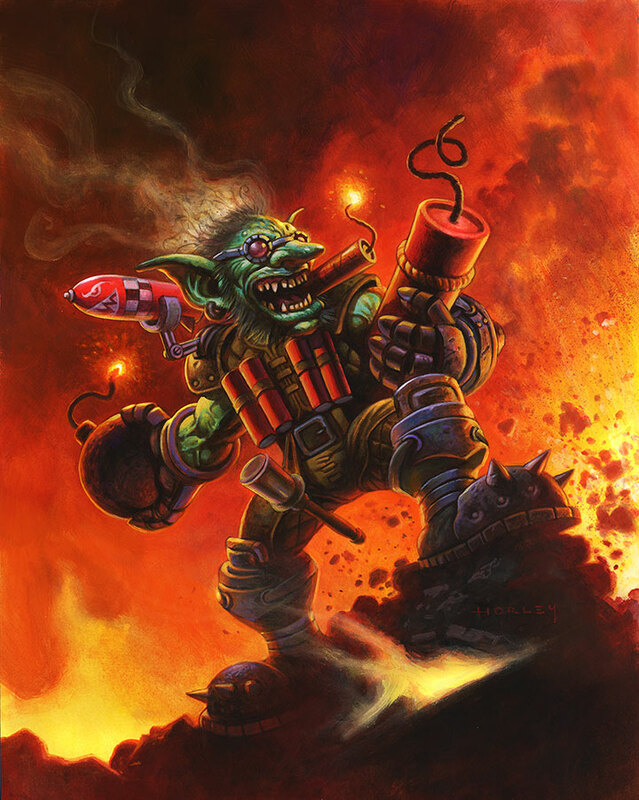 Last time we took a look at the Goblins, with their random bomb-lobbing and haphazard detonations, and this time we’ll walk through some of the cards of the industrious Gnomes, just in case some of you like a little more calculation and a little less combustion in your decks. So – on to the Gnomes! Where Goblins are chaotic, rambunctious, and undeniably maniacal, Gnomes are tad more civil. …but not by much. While brilliant in their command over mechanics and known as fantastic engineers, Gnomes are thought to be as knowledgeable as they are eccentric, leading their incredible inventions to often times end up just as erratic as the far more explosive-driven Goblins. Through their storied history, Gnomes have come up with some ingenious creations; technology is a way of life for them, and their innate curiosity leads them to come up with a vast array of unique and creative ways to complete whatever task is at hand. In the case of Hearthstone, that task happens to be destroying the enemy. It turns out they’re exceptionally good at that! They just do it in weird ways. Take Gnomish Experimenter, for example. A rare neutral 3/2 minion for 3 mana is pretty lackluster. But Gnomish ingenuity comes into play with his Battlecry, which lets you draw a card. Fantastic idea if you have a lot of spells in your deck! 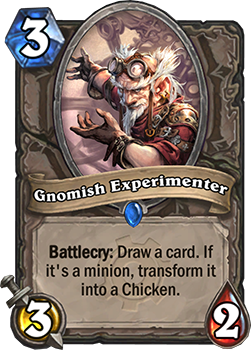 Maybe less fantastic if you end up drawing an important minion; the second half of his Battlecry says that if you draw a minion, you must turn it into a Chicken. There’s that eccentricity! But this is an interesting card which can be a very good deal for you if you run mostly spells; having an extra card in your hand if generally a good thing. 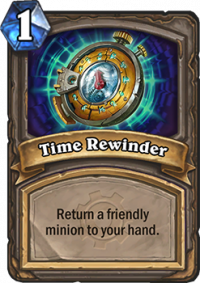 Decks that care about hand size might find him useful, since no matter what, he will not allow your hand size to decrease; even if you draw a minion, you’ll just gain a chicken. Ok, so maybe that isn’t the strongest start if you’re pulling for Team Gnome. Surely there have to be ways to channel their strange thinking and technical prowess into powerful cards, right? Of course there is. 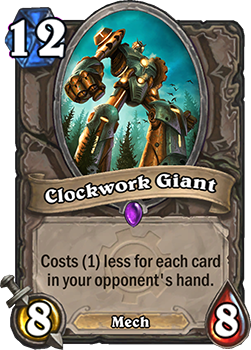 If we’re talking about decks that want to keep their hand size up, it’s a good thing that our friendly neighborhood Gnomes have thought of their enemies adapting this strategy, and developed Clockwork Giant. 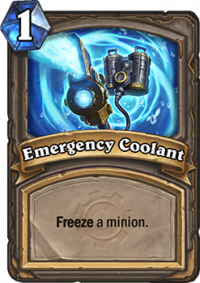 His whopping 12 mana seems absurd – even as an 8/8 Mech – but luckily he costs 1 less mana for each card in your opponent’s hand. As any player has experienced, Handlock decks are a pain to play against, and this is certainly an answer. If your enemy is looking at a really full hand, this Giant is clearly efficient, but even if they only have a hand of four or five, a mana cost of 7 or 8 for an 8/8 isn’t the worst thing in the world. Think of the synergy with cards like Coldlight Oracle and King Mukla, where you’re essentially forcing your opponent to lower the cost of your giant Mech. It’s seems that Gnomes can be just as conniving as Goblins. If you’re into that sort of thing, the much tinier Clockwork Gnome may just be the Mech for you. Despite his comparatively small stature, this 2/1 for a measly 1 mana may find his way into your deck sooner than his Giant friend. 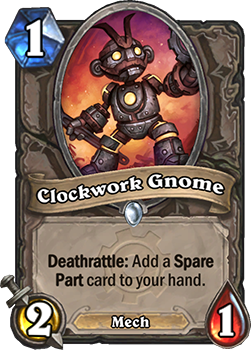 Clockwork Gnome has Deathrattle, which may already catch your eye if you’re an Undertaker fan, but he’ll also give you a Spare Part when it triggers. 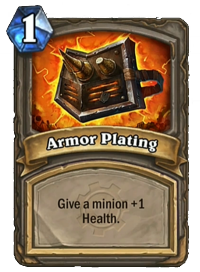 Spare Parts are new to the game with Goblins vs Gnomes, and have fantastic synergy with triggered effects. At 1 mana a piece, each Part has a different effect on a minion. Of the seven Spare Parts, two of them can only be used on friendly minions; the rest can be used on any minion on the board. 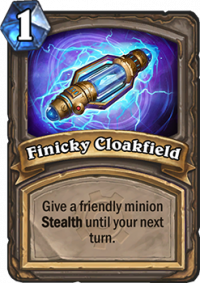 These effects can be incredibly useful – like giving a minion Stealth, or swapping a minion’s Attack and Health – and why shouldn’t they be? As any hard-working Gnome knows, any leftover part from a project (or a destroyed project, for that matter) can be reused to make something better! Gnomes are all about thinking differently, and sometimes that means being a little crazy. Goblins aren’t the only ones that can use RNG to their advantage! 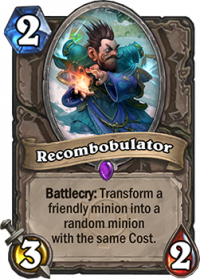 At first glance, you might not see the true value in the 3/2 Recombobulator. He costs 2 mana, which isn’t so bad on its own, and his Battlecry transforms a friendly minion into a random minion with the same cost. Sure, you could end up turning a smaller minion into a much larger, way better minion. That’s the dream. But if you’re going to be a true Gnome, start thinking like one! What if you have a nearly-dead minion out there clinging to life… Who cares what you change it into? It might not be great, but it’s bound to be better than what you had! 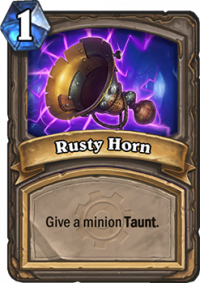 And what if you just happen to change it into a random minion that has a spectacular Battlecry? This has Gnome written all over it; you never know what you’re going to get. 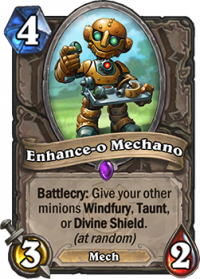 Enhance-o Mechano will let you have a little bit of fun as you tinker your way to victory. This epic neutral Mech is a 3/2 for 4 mana, with a Battlecry that randomly gives your other minions Windfury, Taunt, or Divine Shield. See? RNG can be a good thing, and you don’t have to worry too much about planning for it! 4 mana might seem like a lot, but any of those random abilities can be a game-changer. 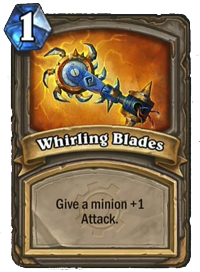 Obviously the more minions you have, the more effective the play, so minion-heavy decks will definitely want to invest in this little guy. You can use him offensively to go hyper-aggressive if you end up with Windfury, or defensively if you roll Taunt. The utility here is off the charts; there’s almost no bad play for him. And on top of all that, he’s a Mech! If you have your heart set on a specifically Mech-based deck, Goblins aren’t your only choice. 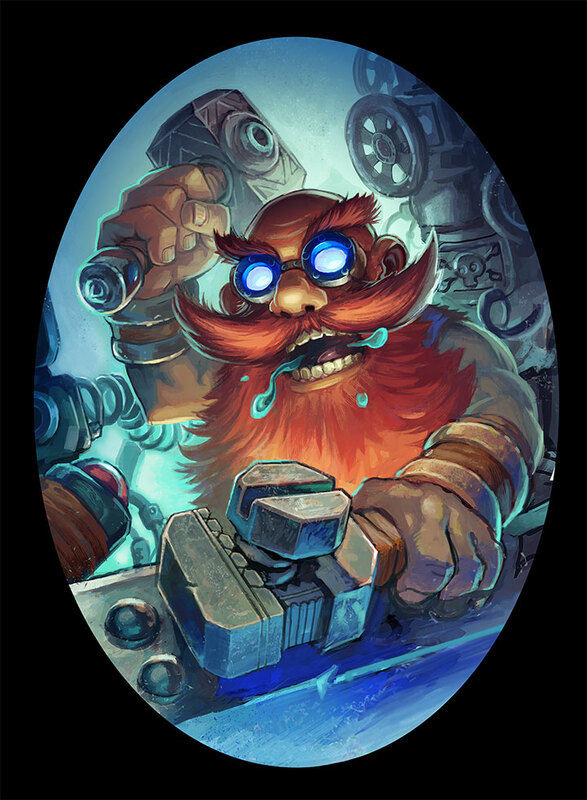 While the little green guys have cards like Piloted Sky Golem, Goblin Auto-Barber, and Goblin Blastmage to bulk out their Mech decks, Gnome fans need look no further than Tinkertown Technician. This guy comes in as a 3/3 for 3 mana, which is a pretty solid card to start, but his Battlecry gives him +1/+1 and gives you a Spare Part if you control a Mech, cementing him as a necessary part of any Mech deck. As we know, Gnomes have the tendency to take some unforeseen risks, but the risk here is just the Spare Part, and at least it’s a calculated one. The worst thing that can happen is that you don’t get the ideal Part given the state of the game. There is no downside! So long as you have Mechs out, Tinkertown Technician is a great value for the cost. 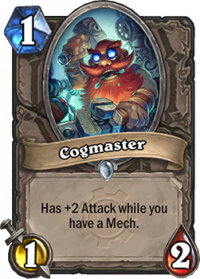 While you’re at it, consider Cogmaster for that Mech deck (even though he’s not a Mech himself), particularly if you want to be a more aggressive type of Gnome. For 1 mana, he comes in at 1/ 2. Not so great. But you have Mechs out, right? Now he has +2 Attack. 3/2 for 1 sounds better, especially if you’ve put some low-costed but still useful Mechs – like Clockwork Gnome – into your deck. You’ll have plenty of Gnome-constructed Mechs to choose from with more than 120 mechanically-themed cards being added to the mix in Goblins vs. Gnomes. So get your tinkering tools out and get ready to craft your finest deck yet – chock full of the wacky, unpredictable, and undeniably creative products of the minds of Gnomes. Goblins vs Gnomes will be releasing their hijinx (along with a brand new game board and the much-anticipated spectator mode) on the Hearthstone world on December 8, 2014 in the Americas and on December 9 for everyone else. The new cards will be available in the Shop, Arena, and through crafting. 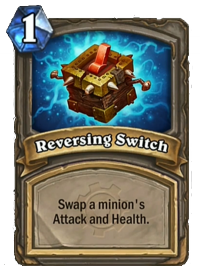 They’ll be in their own appropriately-explosive-labeled card packs to distinguish them from classic cards, and will cost the same as expert card packs, in both gold and real money.